Let's meet again for an after-work climbing session in Protected content Please only join if you have recent climbing experience and know how to belay. 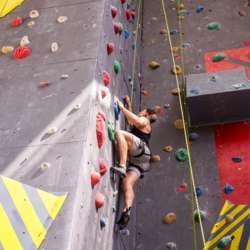 We'll meet at the entrance and split into climbing groups of 2 or 3 people, ideally based on similar weight and skill. If you don't have your own equipment you can rent it at the gym. Fair warning: On week evenings I usually get hungry (=grumpy ;) ) after Protected content of climbing. You are free to continue or if you'd like to get some food afterwards, I would definitely be up for it! P.S. This is NOT a climbing course and I'm NOT a climbing instructor! I'm a climber trying to offer fellow climbers, who may not have a regular partner at the moment, the opportunity to meet and climb together. You should have climbing experience and know how to belay. Here is a quick sanity check: I use a click-up, never learnt the double bowline and manage a 7- on a good day. If you need Google to understand this sentence, then you should not join the activity!